Editor’s Note: Green Collar Foods is raising $1.5 million on AgFunder. There’s no doubt that indoor, controlled environment agriculture (CEA) is gathering momentum. The number of businesses popping up promising to produce clean, sustainable, and locally-sourced produce continues to grow globally. What once was happening as a necessity in countries like Japan to combat loss of arable land due to the Fukushima nuclear disaster after the 2011 tsunami, is now starting to make economical and practical sense around the world. But more often than not, these projects and businesses are building mega plant factories at scale; many indoor agriculture operators argue that scale is needed to make economic sense of constructing indoor farm facilities and deploying the technology needed to make them work effectively. This need for scale has kept inner cities largely out of the trend as capital costs and human capital to develop these facilities are massive, but these are the communities that need economic innovation the most, according to Ronald Reynolds, CEO of Green Collar Foods. There is also a large addressable market for local food, which reached $7 billion in 2013 in the US, according to the USDA, a 46% increase on the year before. Frustrated by the lack of scalable and cost-effective indoor farms, and aware of the enormous untapped assets in inner city communities within close proximity to state funded Land-Grant Universities, Reynolds and his partners launched Green Collar Foods. Green Collar Foods is a controlled environment agriculture platform combining indoor aeroponic growing systems with next generation cloud technology to build a franchise of small-scale, low-cost, and locally-owned CEA production facilities in inner cities across the US and the UK. 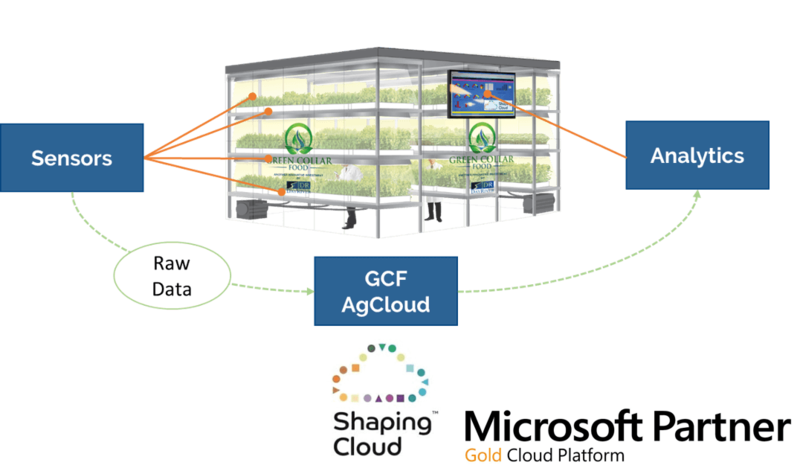 GCF’s model hinges on its technology platform, which combines Microsoft Azure’s IoT suite with GCF’s centralized learning platform and proprietary farm management software, to create the GCF AgCloud. The platform streams data from sensors and open-source APIs to connect, monitor, and control a network of indoor farms. This enables continuous learning for GCF and its clients to extract efficiencies, record plant recipes and improve yields. The GCF AgCloud was built in collaboration with technology partner and investor Shaping Cloud, a business that Reynolds is chairman of. The main aim of this technology is to enable anyone to operate an inner-city indoor farm while consistently learning from the process. GCF is passionate about democratizing inner-city CEA along with increasing the sustainability of each new location. “We want to create real impact in the inner-city communities we are targeting, instead of talking about food deserts and scaring people. The best way is to give people ownership, create jobs, teach real STEM technology skills, all while building economic value,” said Reynolds. Essential to building towards this mission is GCF’s growing partnerships with public and land-grant universities. Institutions such as Florida A&M, the University of Sheffield in Northern England and the University of Connecticut, are helping to promote GCF’s work, as well as contribute to the learning process and data collection. These partnerships will involve the universities providing research and purchasing produce for their catering facilities. In return, GCF farms create jobs, engage the local community by teaching them about agriculture, provide access to GCF AgCloud, and support university research on indoor agriculture. Land Grant Universities can also help fund GCF’s distributed grow data through the Morrill Act, which gives them around $3 billion a year to spend on research with companies like GCF. GCF plans to construct 6,000 square foot facilities which will cost under $500k each. It built a beta facility in Detroit in 2015 which now produces kale and cilantro. This Detroit R&D Hub was used to develop the GCF Aeroponic System and GCF AgCloud. The model is scalable to any number of hubs, which will be individually funded by local investors, and the operators. It has five in the pipeline in Detroit, Michigan; Bridgeport, Connecticut; Tallahassee, Florida; Sheffield, United Kingdom; and Pittsburgh, Pennsylvania. While GCF will not own all of these farms, it has multiple revenue streams from them: licensing its technology / IP, brokering forward-purchase contracts, monetizing CEA datasets across private industry and academia, construction/project management fees, and a percentage of all revenues from the farms. GCF has already engaged with food processors to purchase its offtake. Buying produce from GCF farms reduces these processors’ shipping and freight costs, and increases the freshness of their ingredients, and the US Census Bureau estimates the food processing industry to be worth $89 billion. Reynolds and Casanas came to indoor agriculture from backgrounds in investing and operational management, specifically for a family office, Blenheim Chalcot. After launching their own micro-venture firm called DayRiver, Reynolds and Casanas started researching potential agtech investments for the firm. Drawing on their background working with the public sector and technology in other positions, they realized the potential to use agtech, specifically indoor ag, to alleviate urban deprivation, and that this niche is consistent in every Western society, specifically in the US and the UK. GCF has now been fully funded by DayRiver, and Shaping Cloud, until now. GCF is now raising $1.5 million on AgFunder to build a flagship facility in Detroit, raise investment for new GCF locations, further enhance its AgCloud solution and prepare for their services to form a platform as a service (PaaS). Editor’s Note: Green Collar Foods is raising $1.5 million on AgFunder, check out the profile here.